New Nike in Store 10.17.11. Nike and Undercover founder and designer, Jun Takahashi, once again come together to release its newest collection of high-performance running gear for Fall/Holiday 2011. 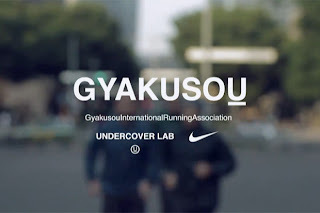 Merging the best in modern innovation, the third installment to the Nike x Undercover Gyakusou collection is rooted in a simple philosophy focused on fulfilling a crucial mission: to create the best running product that strikes the perfect balance between style and absolute functionality. Takahashi designed the collection with thoughtful details that diminish distraction and enhance the meditative quality of running while fitting perfectly in the classically Japanese environment. Nike x Undercover Gyakusou AS UC Lightweight Fill Jacket. Available in Black. Nike x Undercover Gyakusou AS UC Sweat Hoody. Available in Black. Nike x Undercover Gyakusou AS UC 3/4 Top. Available in Black. Nike x Undercover Gyakusou AS UC Short Sleeve Top. Available in Dark Russet and Velvet Brown.